This lesson explains how to draw the shapes you defined in the previous lesson using the OpenGL ES 2.0 API. Before you do any drawing, you must initialize and load the shapes you plan to draw. Unless the structure (the original coordinates) of the shapes you use in your program change during the course of execution, you should initialize them in the onSurfaceCreated() method of your renderer for memory and processing efficiency. Vertex Shader - OpenGL ES graphics code for rendering the vertices of a shape. Fragment Shader - OpenGL ES code for rendering the face of a shape with colors or textures. Program - An OpenGL ES object that contains the shaders you want to use for drawing one or more shapes. In order to draw your shape, you must compile the shader code, add them to a OpenGL ES program object and then link the program. Do this in your drawn object’s constructor, so it is only done once. Note: Compiling OpenGL ES shaders and linking programs is expensive in terms of CPU cycles and processing time, so you should avoid doing this more than once. If you do not know the content of your shaders at runtime, you should build your code such that they only get created once and then cached for later use. At this point, you are ready to add the actual calls that draw your shape. Drawing shapes with OpenGL ES requires that you specify several parameters to tell the rendering pipeline what you want to draw and how to draw it. Since drawing options can vary by shape, it's a good idea to have your shape classes contain their own drawing logic. Create a draw() method for drawing the shape. This code sets the position and color values to the shape’s vertex shader and fragment shader, and then executes the drawing function. Figure 1. Triangle drawn without a projection or camera view. There are a few problems with this code example. First of all, it is not going to impress your friends. 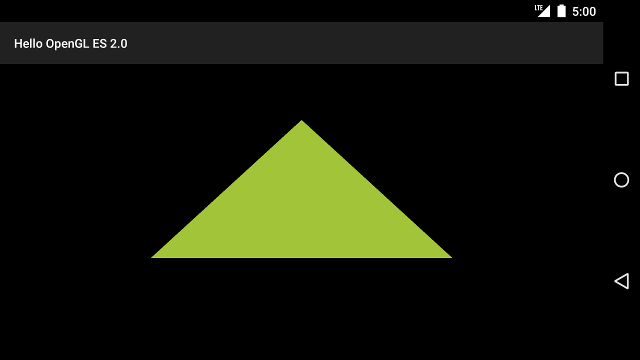 Secondly, the triangle is a bit squashed and changes shape when you change the screen orientation of the device. The reason the shape is skewed is due to the fact that the object’s vertices have not been corrected for the proportions of the screen area where the GLSurfaceView is displayed. You can fix that problem using a projection and camera view in the next lesson. Lastly, the triangle is stationary, which is a bit boring. In the Add motion lesson, you make this shape rotate and make more interesting use of the OpenGL ES graphics pipeline.